As Tom’s last game before heading back to Uni, we picked the newly-arrived Bolt Action from Warlord Games. For a refreshing change, I actually bought a set of rules for which I have all the figures painted so we were able throw 2 forces straight onto the table and get on with it instead of waiting for me to paint up those last 2 regiments or whatever. I rolled to be the German attacker and had 3 tooled up 9 man squads in Hanomags with an HQ squad and a Panzerschreck supported by a STuG III. The defending British platoon was straight from Rick Priestly’s list on the Warlord games website, except that Paras replaced the R.M. Commandos as the veteran choice. I’m a bit of an order dice fanboy (too many games of Epic and Battlefleet Gothic! ), but we used glass beads in a cup for activations as we didn’t have the real thing and the large blue dice on the board are in place of order to dice to show which units have been activated – the smaller red dice are showing pins. The British deployed their regulars and 6pdr hidden on the board, and kept the Paras and Sherman in reserve off the board waiting to see where the STuG was going. I like the hidden mechanic – basically, you deploy your unit on the table in cover, mark them as hidden and they remain so until they move or fire. Your opponent can see them and fire at them, but the cover save is so good that it’s unlikely to cause any damage so you’re probably better off trying to draw their fire rather than wasting activations on futile shooting. 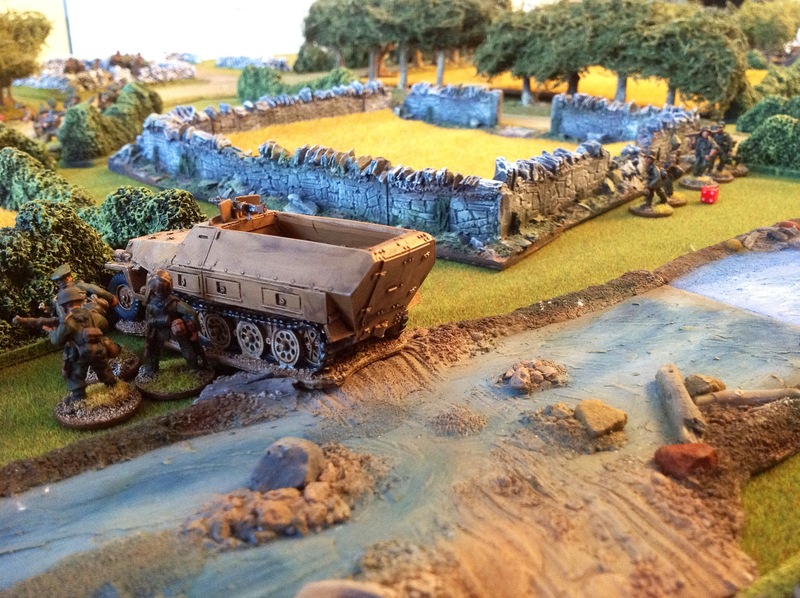 The British got the first activation and put the 6pdr covering the road on overwatch – I obligingly drove a half track up the same road, hoping to draw fire and push a second half track behind it. The 6pdr crew held their fire until the Hanomag cleared the bridge, then put a shell into it causing massive damage (3 more than the roll needed to penetrate) so they got 2 rolls on the damage table which has a 50-50 chance of a destroyed result – the British of course didn’t need 2 rolls, and the half track was destroyed, 2 of the squad inside going up with it. What was worse for me was that the bridge was now blocked, so the only way over the river (which ran parallel to two thirds of my board edge) was over a ford which was heavily defended. The rest of the turn consisted of me cautiously bringing on my remaining 2 half tracks and tank – I succeeded at avoiding being seen, so the British merrily put the rest of his units on “ambush” (think overwatch) as his units were activated. On turn 2 I led with the STuG hoping to cover the half track deployment into the trees on my right flank – unfortunately, a British activation came out next, so he advanced the Sherman he had held in reserve onto the board on an advance order, took up a hull-down position behind a hedge then let off a shot at the STuG. The Sherman 75mm counts as a medium AT gun, so needed 4+ to hit then 4+ to penetrate the front armour of the STuG. In typical fashion, he rolled a 5 to hit followed by a 6 on penetration so that was 2 rolls again on the damage table with a 50/50 chance of destruction on each. 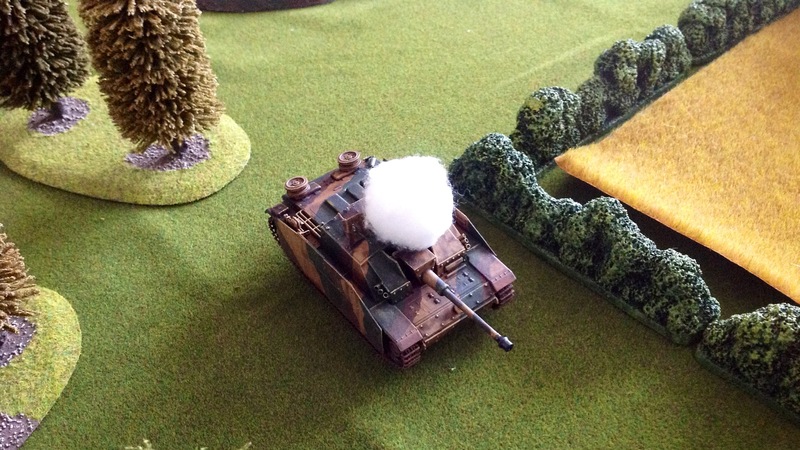 Both hits rolled destroyed, so the STuG was blown sky-high – not a good start to the turn for the Germans! The only good thing was that the STuG had drawn out the Sherman, so my half track managed to get into the cover of the trees and its infantry squad and Panzerschreck dismounted. The British 6pdr could just draw line of sight to my left flank half track with the HQ and last squad in it after I had moved (I miscalculated slightly), but luckily he chose to put HE fire into the dismounted squad instead and missed. I tried some shots at hidden units in response with predictable results – no sixes followed by sixes rolled, so no hits. 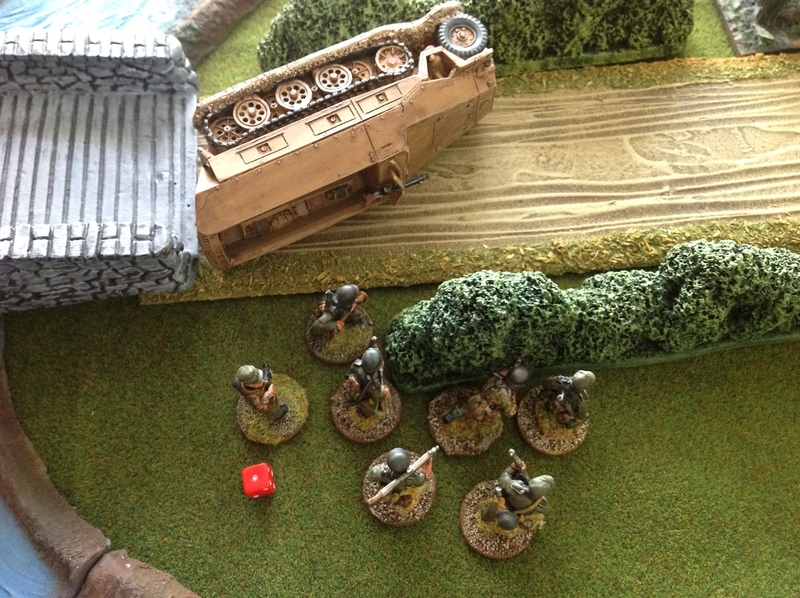 The squad from the destroyed half track on the road made their way towards the left flank, taking a couple of hits from an MMG and LMG on overwatch both resulting in a casualty and a pin – this was not good as the squad was now on 3 pins and would need a rally soon. The British decided to take most of their units off overwatch at the start of the 3rd turn, so most of their beads went back into the cup. The plan it seemed was to advance them into better shooting positions and it worked a treat. My German infantry couldn’t seem to hit a barn door whilst they accumulated hits and pins aplenty. The Sherman destroyed the half track facing it before it could even get a shot off with its MMG – luckily the Sherman was hull down so couldn’t use its own MMG against the squad or the Panzerschreck. My advance had ground to a halt, and I was going to have to rally some squads before the number of pins became unacceptable, as this affects the dice roll needed to receive an order. On turn 4, 6 (that’s SIX) British activations came out before the first German one did, by which time the German force was decimated from pins. When a German activation did eventually come out, I spent it trying to rally pins off but failing (with order dice rolls at minus 4 or 5 so needing to roll 4 or 5 even with an officer bonus to get the order through). My last hope against the Sherman, the Panzerschreck, lost a crewman to H.E. from the tank so was now unusable. I had a Panzerfaust with the squad in the trees, but that had to get into range (12″) – unlikely given the volume of fire that would come its way if it closed. I conceded the game at the end of this turn, as my squads would never rally off the number of pins they had even if I got 6 activations in a row straight out of the cup! For the sake of simplicity we didn’t have any artillery or a preliminary bombardment so none of the British squads started with pins, and this may have made a difference early on to the German advance. Fair play to the British in counter attacking before I could get a foot hold, and even without the run of 6 straight British orders on turn 4 I think I would have been in trouble. So what did we think of the rules themselves? I can see that the generalisation of tank armour and guns might give some people problems – a 6pdr has the same penetration as a 75mm on a Sherman for example, but I don’t mind this too much if it gives a quick game – and it does. Even if I hadn’t been rolling the fistfuls of ones and twos which ended the game on turn 4, we would still have finished in around about 3 hours – not bad given the number of troops on the table, and the result was completely plausible. The fact that the British didn’t miss one AT shot, could roll sixes on demand and stop any German activations coming out of the cup is hardly the fault of the rules! As the Germans, I only killed 1 Para in total in the entire game – he was from a PIAT squad but after the game we discovered that 2 man teams count as a small target and are therefore -1 to hit so I wouldn’t even had got him had we been playing the rules right – it was a real drubbing! We did have some minor concerns – for example, is -1 an adequate penalty for tanks moving and firing? Nevertheless, I’m looking forward to playing the rules again, maybe next time using some scenarios from the excellent Iron Ivan “Without Fortune” Arnhem book. I also want to try the game splitting the squads into separate LMG and manoeuvre sections (the rules allow this by having a minimum of 1 NCO and 4 men in a unit) as this would be more like the structure of real WW2 squads – whether they would then be too brittle because of the small number of casualties they could absorb will have to be tested. I also think the rules would work perfectly well for the Spanish Civil War, so that’s got to be on the list of things to try out. The problem with being a rules junkie is that when you see a splendid new set of rules for £8 on Amazon for a period you’re interested in and you’ve just painted a load of Romano-British for another ruleset, you start thinking “what extra would I need to get to do this new ruleset?”. When the answer turns out to be a few cavalry figures and some movement trays, it’s chocks away! 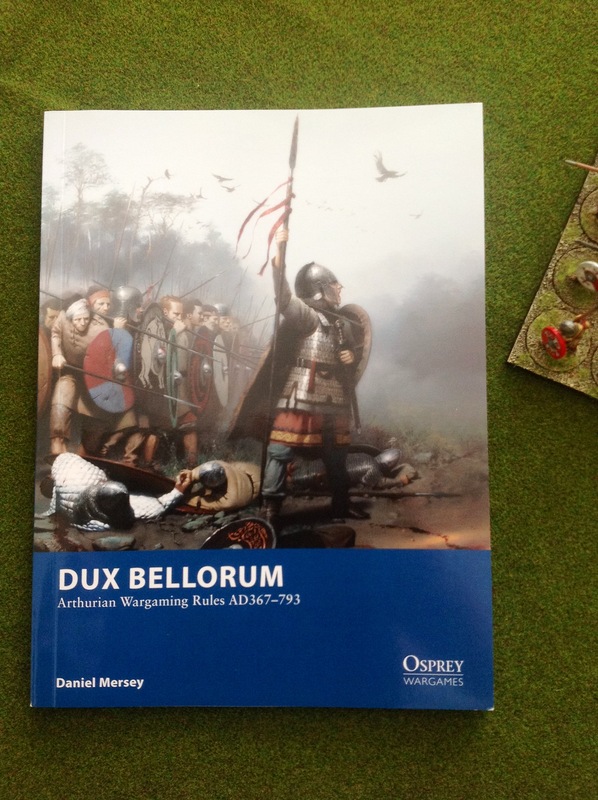 Of course, I did do some research before parting with my hard-earned cash – the author actively supports the rules through a page on BGG http://www.boardgamegeek.com/boardgame/88079/dux-bellorum, which is unusual in itself for figure games I think, but it’s very well done – it was here that I found a run-through the game turn (which was meant to be in the book but cut due to space pressures) and also a link to his blog which has some battle reports and sample armies on it – I’ve added a link to my Blog list. The armies were fairly standard. The Saxon had the compulsory Foot Companions with his leader, 2 Noble Warriors, 5 Ordinary Warriors and 2 bands of Foot Skirmishers with bows. The Romano-British had the Foot Companions, 2 Noble Shieldwall, 3 Ordinary Shieldwall, 2 Ordinary Riders (Knights of Gondor proxies!) and also 2 bands of Foot Skirmishers, but with slings instead of bows. Both armies had the basic 6 Leadership Points (I preferred to get more units on the table as I was learning the game) and the allocation of these leadership points at the start of the turn is something which interested me when I first saw the rules. Leadership points can be used for various things, from adding dice to combat, cancelling hits, increasing your units roll to move (or decreasing if you are trying to stop your warriors’ uncontrolled charge!) and even moving out of sequence to pre-empt a dangerous move by you opponent (this last bit reminded me of Ben Hull’s excellent board game Musket & Pike Battles Series from GMT). 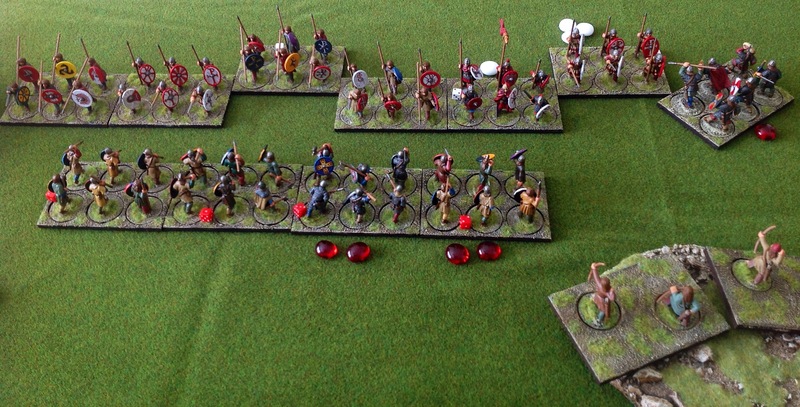 I used red beads for the Saxons and White for the British to keep track of Leadership Points (LP from now on). There is a very strict turn sequence, which each player performs in sequence – mostly the attacker goes first, although in the 1st phase (the placement of LP) the defender has to go first, making for some tough decisions as you can only place a maximum of 3 LP with a group or unit and they all have to go down at once for that unit. Movement is by troop type, so skirmishers followed by cavalry followed by infantry, with attacker going first unless the defender spends an LP to pre-empt (which the attacker can counter with another LP if his unit has one and so on..). Movement is not automatic – you have to make a bravery test against your unit’s (or group’s, using the highest) leadership and you can influence the roll with LP, which again is good as it mitigates against my dice rolling (sometimes – see below). I like the idea of blunders from my Warmaster days, so I used the optional rule for rolling an unmodified 2 or 12. After placing the LP for turn 2, the first phase of missile fire took place. The Saxon archers were right on the money, causing 2 hits on the Nobles at the end of the British line which had to be cancelled out by LP. The British slingers then opened up on the Warriors on the opposite flank in support of their cavalry. 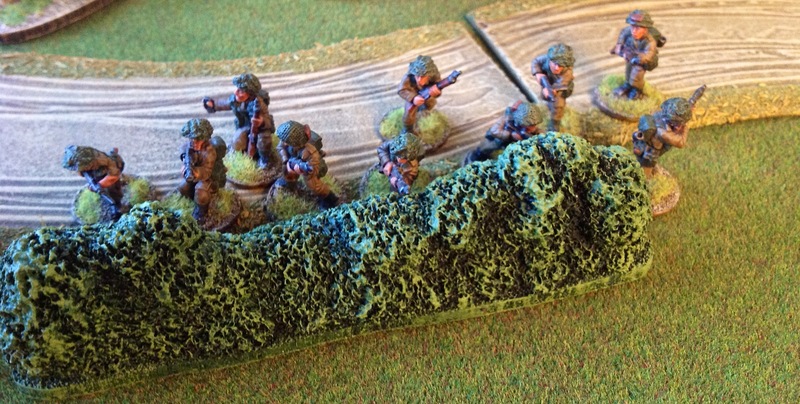 However, because a part of their base was in the wood, they lost 1 dice per unit – doh – should have read that bit in the rules before moving them in there! As the Skirmish units had both shot, there was no movement in the move skirmishers phase, so I went straight to the cavalry phase. The British had allocated a total of 4 LP to the 2 cavalry units, so there was no way the Saxons could pre-empt their charge and both cavalry units crashed into the opposing Warriors. After this, I found that most of the Saxon infantry were within 3 base widths and so had to charge if they passed their bravery test – the Saxon Companions clipped the edge of the British line, but it didn’t count as a flank attack as they started in front of the unit and not behind the flank. The Nobles supporting the Companions were just outside 3BW, so had to roll to just move – they rolled a 12 and as I had decided to use the optional blunder rule, they took a cohesion loss and stood their whilst their betters fought alone. The rest of the Saxon line were within 3 BW, so all charged home and in a series of melees, units swapped blows resulting in both sides lines becoming fragmented though not a lot of damage was done due to LP saves. 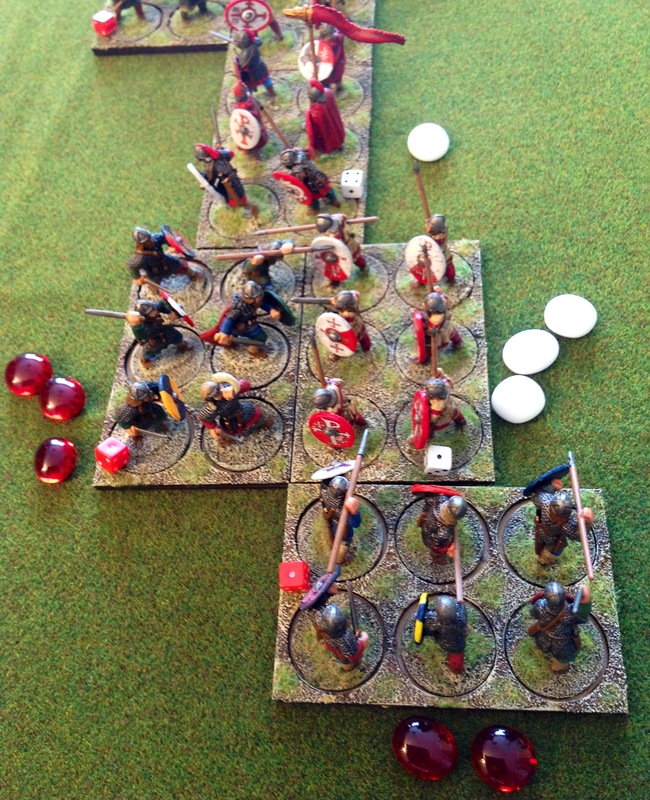 The British Nobles at the end of the line drew with the Saxon Companions, so the combat extended into next turn. Turn 3 and time to assign LP. The Saxons wanted to be sure to get Nobles on flank to advance this turn so gave them an LP and assigned to the rest of their line of warriors to absorb hits (giving 2 LP to the warrior unit with 3 hits) . The British priorities were for the cavalry to break the infantry facing them on the right flank while not allowing their left flank to collapse, so assigned 1 LP to each cavalry unit, 3 LP to the Noble shieldwall facing the Saxon lord’s unit and 1 LP to their own unit of Companions which had accumulated 2 hits. The Saxon bows opened up on the British Companions this time, as no matter who you are a 5+ with an missile weapon will hurt you. After scoring 2 hits, only 1 could be discarded by burning an LP so the Companions were effectively at half strength and cohesion cannot be restored (as in Dux Britanniarum for example). Typically, the British slings both missed. As all skirmishers had fired I went on to cavalry movement phase with both British riders charging their opposite warrior unit, though one failed his bravery test and had to burn his 1 LP to charge home. 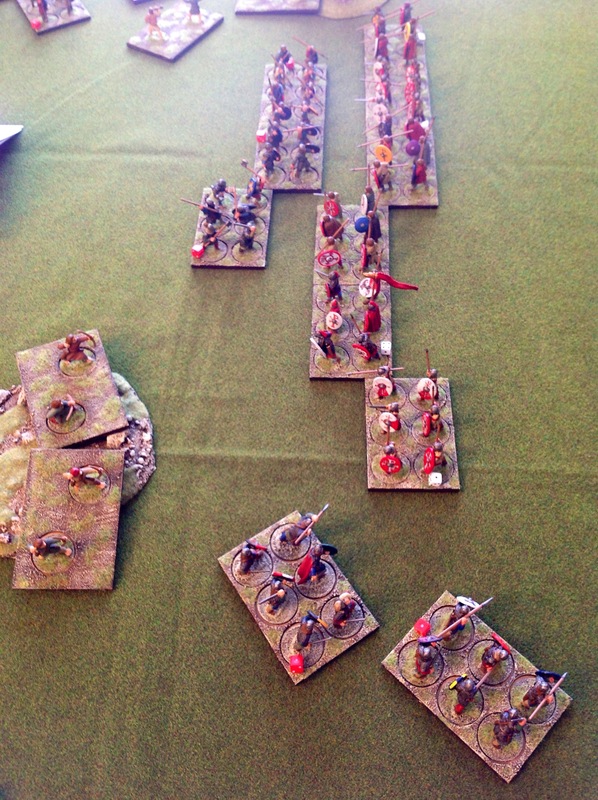 So on to the infantry and the Saxon noble on the flank march managed to move this turn (just!). The line of warriors charged the shieldwall, all except for the nobles who rolled a 12 (a blunder) which even their 2 allocated LP couldn’t fix, so they took a cohesion hit. In response, the British unit which had fallen back last turn also failed to move to rejoin the shieldwall, but this wasn’t as bad for the British as the Nobles chickening out was for the Saxons. On to combat. The British left shored up by LP actually beat the Saxon Companions and they had to fall back. 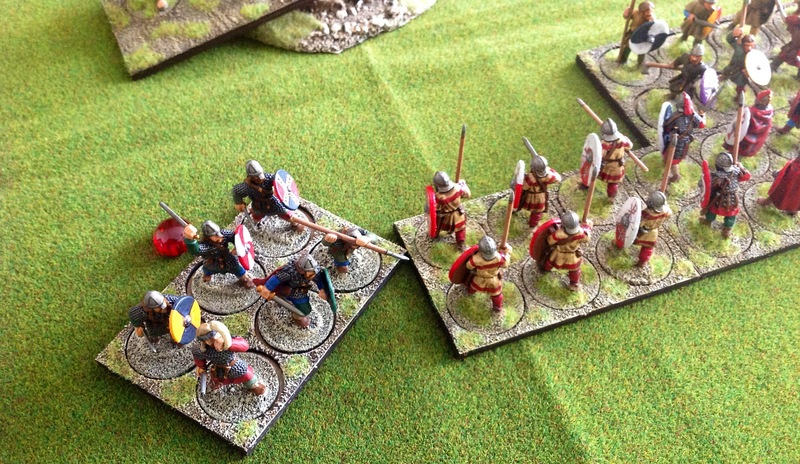 The gap left in the line by the Saxon Nobles then began to hurt – one unit of Warriors was facing the British Companions supported (adding 1 dice) by a unit of ordinary shieldwall – it was only 7 British dice against 6 Saxon, but the British scored 4 hits to the Saxon 1. Even with discarding a LP the Saxon cohesion hit 0, so they routed and would lose a LP at the end of the turn. Something to note is that supporting units need to lose by 2 hits not 1 before they retreat in melee. The British Companions were hit though and having spent their LP they had to take it and with only 2 cohesion left would need to be given some LP at the start of next turn in case those blasted bowmen continued to be as accurate as they had been. Along the rest of the line, the Saxons pushed the British back, leaving the situation in the centre looking like this. On the British right flank 1 cavalry unit lost and fell back against the Saxon warriors, but the other unit won big and left a unit of warriors on 1 cohesion remaining – not good. Turn 4 LP allocation was predictable. The British placed 5 out of 6 to shore up their left flank, whilst the Saxon placed all 5 of his on the same flank. In the missile phase the bowmen took aim at the British Companions and let fly, casuing 1 hit and burning an LP. The British slingers caused a hit for a change, taking the other Saxon warrior unit facing the cavalry down to 1 cohesion. The slings in the wood even hit the end of the warrior line with their shot – all good stuff. Everyone passed their movement rolls apart from one British cavalry unit, but they had an LP to burn, so they were OK. All units in contact now fought – first off was the vital battle on the British left flank where it wasn’t looking good for the unit of Noble shieldwall. Rolling 12 dice to the British 5 the Saxons were hopeful, as both sides needed sixes to hit, but the rolls ended up as 2 hits each – the British had 3 LP to discard their 2 hits, but the Saxons didn’t so lost the fight, took the hits and fell back – the flank was safe for the moment. The fight raged along the line, and the Saxon luck continued. In the next fight of Noble warriors verses ordinary shieldwall, the Saxon rolled 7 dice to the British 3, but all 3 British dice hit while none of the Saxon dice did, so with no LP to discard hits the Noble’s cohesion went to minus 1 and they promptly routed. The next 2 combats were won by the Saxons, but only caused a single loss to each of the British units, so it was with some trepidation that the Saxon moved on to the flank cavalry against warrior battle. Both battles were 5 dice each as the cavalry got the charge in, both hitting on 5+, so this was going be be a crap shoot. The first battle ended in 2 hits each which wiped out both sides, but in the second fight the British scored 4 hits to the Saxon none, so another unit of Warriors bit the dust. This took the Saxons to 50% losses (excluding skirmishers) which would provoke an army morale test for each unit at the end of this and every following turn. Basically the army morale test involves each unit in the army taking a bravery test and routing if this test is failed, so it is brutal, though you can use any remaining LP with a unit to offset the dice roll. A unit of Warriors and a unit of Skirmishers failed the test taking the last LP with them, so with the Saxon army reduced to 3 units it was game over. I like the fact that the game plays fast and on a 4′ by 3′ table. The game itself reminds me of my best experiences with DBA (though the mechanism are quite different and the rulebook is written in a readable manner, unlike DBA). It has a big battle feel more so than Dux Britanniarum or Saga, but with a comparable number of figures on the table – this is good, as I will never be able to paint enough Arthurian era figures to stage a Hail Caesar game for example, and while I was playing through I did feel like I was moving units rather than figures. There’s certainly variety to be had even in the small number of supplied army lists, with the Land Raider list allowing you to construct an all cavalry Romano-British force whilst your standard Romano-British force can be mostly shieldwall as my was in the report above (and a tough nut to crack for a warrior army like the Saxons). I quite fancy a Pictish force in the future for the hit-and-run capability. And yes, I’ve ordered some Arthurian cavalry, but you always knew that was going to happen, didn’t you?